Today was a proud day for the Northern Territory. A day that I’m predicting will spark many , many arguments between North Queensland and the Top end of the Northern Territory. 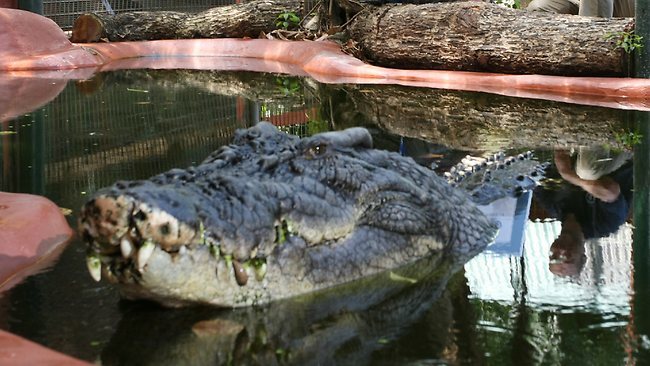 No it’s not the election , no one gives a rats arse about that , it is the news that Filipino croc Lolong has gone to crocodile heaven ( ew can you imagine that for a moment … nope not a happy place … ) and left ‘our’ Cassius (pictured) with the title of the Worlds Largest Croc in captivity. The fact that Cassius lives and has lived in Queensland since 1987 is not important to the Northern Territory. What is important is that it was here he was found chewing on boat propellers and other non appropriate food items before being shipped off to spend the rest of his life in a small swimming pool on Green Island , North Queensland. It will be interesting to see how the Queensland media responds to the NT laying claim to the croc they refer to as a ‘Queenslander’ – watch this space ! Huge and scary creature. Don’t know how that guy stands that waters. Feels yucky from here. Hey, as long as he dons the QLD Jersey every state of origin I don’t.care where he comes from…. However, he could have better accommodation while.he is here. Okay, Kels, seeing the size of that croc compared to those grown men is kind of terrifying. That guy is massive! Sorry I’m so late commenting. It’s been a wild week. Hope you’re feeling okay. You must be getting mighty damn close to delivery, my friend. Thats ok Kathy I have been hopeless at keeping up with my WordPress world lately – the bigger I get the harder it is to concentrate on anything longer than 1.3 seconds 😉 I imagine moving would be just as distracting ! 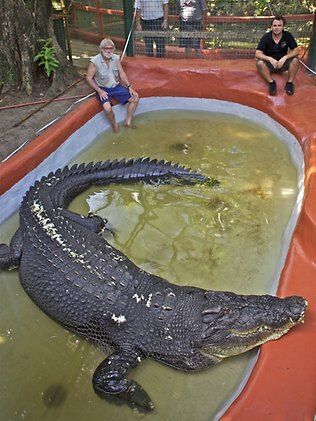 Yes they sure do make them big over here … as tempting as it gets I rarely swim in this part of Australia !